Magdeburg, October 2017. Petromax presents a new smart piece of equipment for your open-air camp. The Petromax Atago is both a cooking and baking place as well as a mobile fire place. Thanks to the unique folding mechanism, it can easily be stored and the double-walled design keeps the Atago cool on the outside. The all-rounder combines chimney and wood boiler principle and is heated up in no time. The ventilation and temperature are continuously adjustable. The Petromax Atago has a special place in the Petromax product world: It can be combined with a number of equipment pieces, such as many of the Dutch Ovens and baking pans, all Petromax Pans or the Petromax Percolator Perkomax. Thanks to its various application possibilities and the folding mechanism, the Petromax Atago is the centre of your open-air camp. Whether you want to grill steaks, to cook in a Dutch Oven or bake a cake, the Petromax provides many functions which make it a true all-rounder in the Petromax product world. And even after your meal outdoors, the Atago stays in the centre of attention, using it with the Petromax Percolator Perkomax to prepare coffee. Finally, the Petromax Atago is an elegant and safe bowl for your camp fire. « For some time now, our customers have asked for an all-rounder that is space-saving and provides various application possibilities outdoors. This is why we have developed the Petromax Atago and we are confident that, after trying it once, people never want to be without it. The Atago features many outstanding details which make it unique. » says Jonas Taureck, the CEO of Petromax. Holding and setting up the Petromax Atago, you will already feel its extremely robust and durable quality. The Petromax Atago is set up in no time and with just one hand, thanks to its unique folding mechanism. Retracting the Atago is just as fast. With a height of only 5.9 in when retracted, it takes up minimum storage space. Charcoal, charcoal briquettes and wood can be used to start a fire. The continuously adjustable ventilation allows you to regulate the temperature as desired and, with the air supply fully open, the Petromax Atago is heated up in no time. Thanks to its highly elaborate design, the chimney effect is used optimally. The intelligent ventilation further promotes the wood boiler principle, whereby the Petromax Atago is heated up very efficiently and requires little fuel. The Petromax Atago is made of stainless steel with a double-walled design, which makes it not only appealing but also effectively isolates the burning chamber while keeping the outer wall cool, even after a longer use. The Petromax Atago radiates little heat at the bottom. With its three feet, it will be stable on any ground. The Petromax Atago with its three basic functions is perfectly fitted for the Petromax product world. The Petromax Atago can be used as a classical grill. Once the fire is started with charcoal or briquettes, it is quickly heated up thanks to the chimney effect. 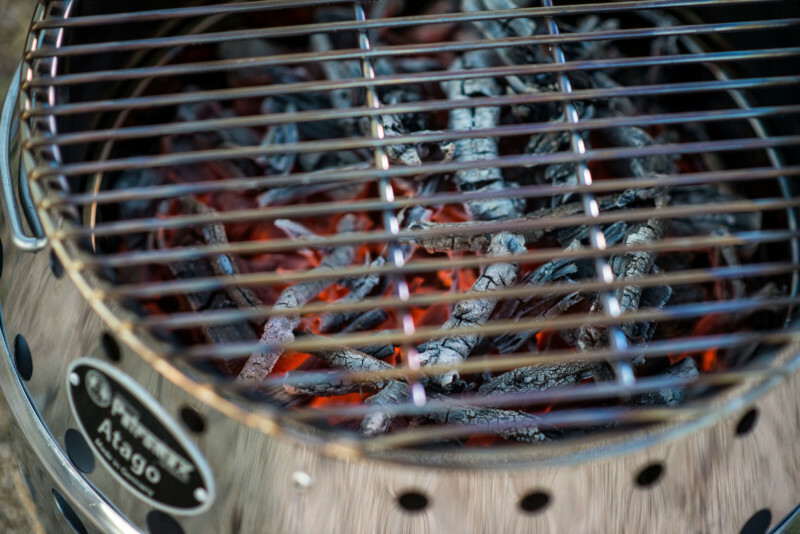 A matching grilling grate and charcoal grate are included in the scope of delivery. The Petromax Atago is an efficient and versatile cooking place. It is best used in combination with the cast-iron Dutch Ovens by Petromax up to size ft9, which fit into the inner cylinder of the Petromax Atago and are placed directly on the ember. The Dutch Ovens of size ft6 and ft9 are ideal as they are flush with the Atago which ensures an optimum heat yield with its good isolation. The Loaf Pans are used in the same way to bake bread or cake or to prepare casseroles. The Atago is also perfectly suited to be used with Ring Cake Pans or the Petromax Percolator to prepare coffee. On top of the round opening of the Petromax Atago, the pans quickly reach the perfect cooking temperature and, in combination with the Petromax Fire Bowls, the Atago becomes a Plancha grill. After having used the all-rounder to prepare the dinner, a camp fire for a cosy evening can be started directly in the Petromax Atago, which makes it a practical and safe fire bowl. The Atago can be used as fire bowl when being extracted as well as retracted. With the perfectly matched convection lid, the Petromax Atago will be a convection oven. The circulating heat provides for even and energy-saving baking and cooking outdoors. Thanks to the coated inside and the close-meshed aramid fibres, heat can hardly escape which ensures a constant cooking behaviour and even allows for baking pizza, also in the open air. Petromax also provides a matching bag for clean and convenient transport and storage of the Petromax Atago. Petromax is a leading manufacturer of equipment for outdoor cooking and living. Its coordinated product world combines tradition and innovation in a unique way. All Petromax products are of highest quality, extremely durable and feature elaborate details. Experiencing raw nature with traditional and yet well designed equipment is the focus of Petromax’ product world, which can be acquired through a well developed international network of specialised retailers with currently more than 3,000 shops as well as the online shop. Petromax’ management consists of Jonas Taureck and Dr. Pia Christin Taureck.